First off, make sure to read Flux’s guest article about the art controversy (and other related topics), because it’s well worth a read. Secondly, continue reading this update! As usual, there has been a plethora of updates on both Diablo 1&2 Wiki as well as Diablo 3 Wiki, and we’ve had to pick out a few selected ones, or the list would be as long as the guides update from last week. We have seen further updates after Flux’s article and since several of these contributions relate to the interface of the game, we’re giving you a full update on Interface changes throughout the Diablo III development thus far, and also touching on what we know of the upcoming trading interface features. 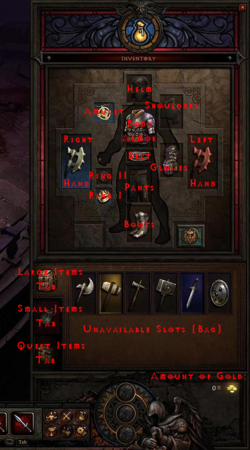 Paper doll – Lots of paper dolls in Diablo III. Resource pool – It’s not just mana any more. Fury – Traffic light of the Barbarian! Trading – Will be a major pard of D3. Auction House – Finally, an Auction House for sales! WUG – Ug mug dug rug… WUG! Also note that the Media Coverage uber list has been brought completely up to date. It’s a one-page listing of every single interview, preview, feature, blue post, and screenshot or art release since Diablo III was revealed. Very handy for your browsing or researching needs. As usual, if you’re interested in helping the community by contributing to the wiki but unsure on what you can do and how to do it, drop me an e-mail at or a message me on the forums/wiki, and I’ll be more than happy to help! A huge thanks to all the contributors who have pitched in on DiabloWiki in the last few weeks! Thank you DxAxxxTyriel, Danco, Matek, Azymn, Mizantrop, Valmy, Holyknight3000, Medievaldragon, Widus, Vipermagi, Kamikazie-Bunny, Orphan, Sidewinder99, Saviorik, Prymeking, Doc, Froboy449, OiMa, Sinistra, Dradloff, Bunkaido, Reelix, Gluecks, Sing in Silence, Scorp144, Dethklok, Nitsuj and Netmoe! The DiabloWiki wouldn’t be the same without you!